Please welcome Andrea from Love Learning to our blog today. She’s sharing her ideas on how to incorporate life lessons into your classroom management repertoire. 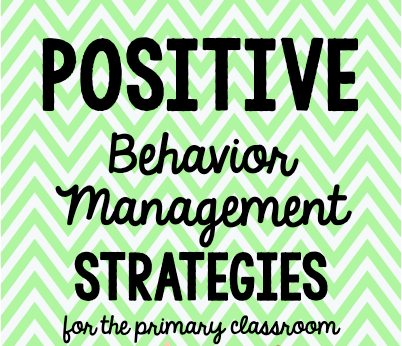 One of the biggest fears that I had when I first started teaching was classroom management. Even worse – I had accepted a position as a fifth grade teacher, and fifth graders kind of scared me! Sure, you learn various strategies in college, but we all know the reality: If you can’t “control” your classroom, it’s going to be a very rough year. Sadly, I have seen several teachers leave the profession because they had such a hard time managing behavior that their teaching career just didn’t seem worth it. I spent that entire summer before my first year trying to research various classroom management strategies. This was before Pinterest, so I actually searched through books! 🙂 One of the books that I happened to pick up was Ron Clark’s book, The Essential 55. The booked hooked me in after the first few pages, as he is quite hilarious. Saying thank you within three seconds of being given something. That first year, I used several of his “essentials” in my classroom. Guess what? They WORKED! Now, mind you, I did have other rewards and consequences in place, but teaching students to be respectful, have good manners, and encourage their classmates made a big difference that year and every year afterwards. As a class, my students turn around and say, “Thank you” to the janitor when he comes to take the classroom garbage, or they say “thank you” to the lunch lady or to the librarian that checks out their books. The boys start to stack the chairs for the girls (without me asking them to), or they clap for the opposing team during field day competitions even when they lose! I cannot tell you how many times my class has been complimented on their good manners throughout the year. It’s a fairly simple concept, but it’s something that has to be deliberately taught. It doesn’t come naturally, and it’s not always taught at home. 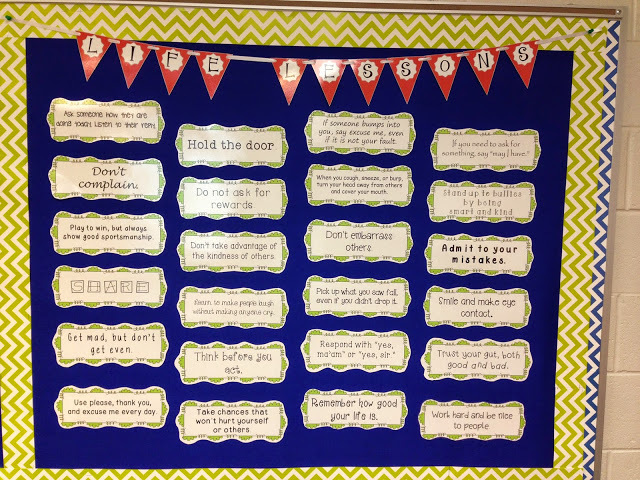 Last year, I finally got the bright idea of posting some of these ideas and other essentials on my bulletin board so that I can refer to them often. This turned into my “Life Lessons” board. At the beginning of the year, I focus on one “Life Lesson” a day. This gives us an opportunity to have a deep conversation about each one and helps students remember them. Besides, students are still in the “pleasing the teacher” mode at the beginning of the year, so they will try hard with them! All students have to write about each lesson, what it means to them, and why it is important. You have to PRACTICE them! Get your students up and moving, and have them practice holding the door for one another! The more practice they get, the more meaning they will have. Refer to them often, and refer to them throughout the whole year. Praise kids when you see them following these lessons (when they think you are not looking). Have a time each week (it only takes a few minutes) where students acknowledge other classmates for great citizenship. THIS is probably more meaningful than anything else. Integrate them into your curriculum! Write simple, compound, or complex sentences using the lessons. Refer to them throughout your social studies curriculum as you talk about historical leaders. 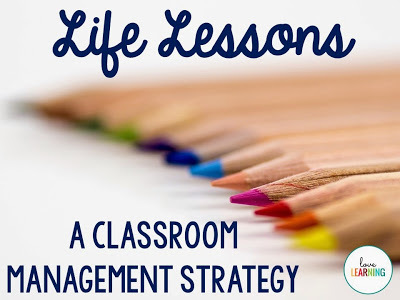 Using “Life Lessons” in your classroom definitely takes a deliberate effort on your part, but once students “get it,” the classroom is truly a different place! I have been teaching fifth grade for the past eight years, and I can’t imaging doing anything else! I love to make learning interesting and exciting, and the more engaged the kids are – the more excited I get about recreating those learning experiences. I want my students to love learning! 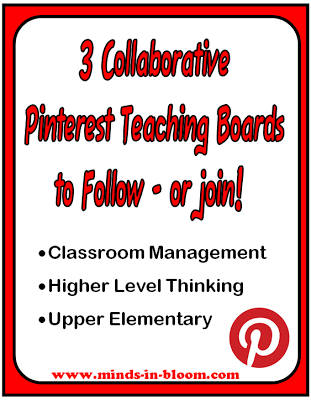 Follow my blog adventures, connect with me on Pinterest as I explore new classroom ideas, and follow me on TPT for freebies and engaging resources!